I continue to coordinate a series of Design Challenges for the Energy Innovation Center (EIC). The program includes high school students from the Parkway West consortium of schools. This spring term three student teams – Parkway West Career and Technology Center (PWCTC), Cornell, and Carlynton – will finalize their research and prepare to present on “A Safety Plan” and another team of three schools will work on a Design Challenge that focuses on the development of a “food kit” for the Energy Innovation Center. The student consulting team from PWCTC will create the menus, while the other student consulting teams from West Allegheny and Montour will work on the packaging and nutritional value for the food kits. For both Design Challenges the EIC has enlisted the help of a series of experts to guide the process. For the Safety Plan the Community of College from Allegheny County (CCAC) is sharing its Director of Safety and Security, while SimTable, a breakthrough technology for safety incident training and modeling, will provide its technologies for the student consultants to use. For the Food Kit Design Challenge Chatham University’s CRAFT team will assist the students as well as 412 Food Rescue. Both projects demonstrate the power of real world learning and collaboration with teams of experts working with the student consultants from the kick-off to the final presentations. I’m hoping that the Design Challenge project will be one of the ten Spotlight on Innovation projects selected by Remake Learning to present at the HundrED Conference in Helsinki in November 2019. As the co-chair of the Consortium of Schools Networked (CoSN) I present each year at the annual conference. This year I had a special honor. Edtech Magazine published a story about my presentation on “Scaling and Sustaining Innovation,” CoSN’s deep dive for the Driving Innovation project. In addition, I had an article published by Getting Smart on the upcoming CoSN report on Accelerators for Driving Innovation – Data-Driven Practices. For my article I tapped into two Pittsburgh area schools – Carlynton and Allegheny Valley – that are applying the Data Fluency project from CMU’s CREATE Lab. The project uses data to enhance student voice and agency. The AYA Discovery Zone project at Community Day School kicked off with students trying to determine the best location for solar panels that will be installed this spring. AYA Instruments and I also met with administrators from Fort Cherry, West Allegheny, and PWCTC to begin to work on a Sustainable Energy project for the fall at the EIC. 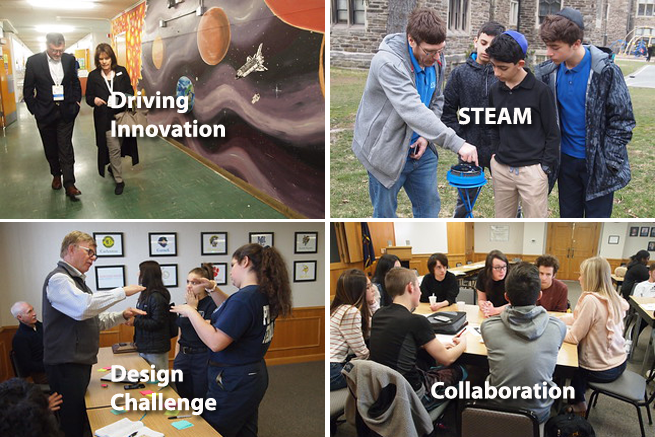 Teachers from the three institutions will participate in a mini-Design Challenge this spring at Parkway West to prepare for a fall event around Energy Careers. I’m working with the South Fayette School District to prepare for the annual STEAM Innovation Summer Institute. The Institute will run from June 17 – 20, 2019. For this year’s Summer Institute educators can take a deep dive exploring and sharing innovative practices with teachers from the region and beyond. You can choose sessions from several pathways: computational thinking, CS/STEAM innovation, visible thinking, and leadership. For the South Fayette project I provide assistance with the evaluation and documentation of the Summer Institute. The Three Rivers Educational Technology Conference planning process began this spring. This year the conference will move to Columbus Day, October 14, 2019. Baldwin High School, a suburban school district just outside the city of Pittsburgh, will host the event. This year’s theme will focus on the Future of Education with a special spotlight on Educational Innovation in Pittsburgh.